A few days ago, in B&M's in Westhoutghton, I was talking to the drummer out of Wigan Ovation! @tonker wrote: A few days ago, in B&M's in Westhoutghton, I was talking to the drummer out of Wigan Ovation! How very unfortunate for him you. Never hear that at an event. Heard it on the radio though. Have you heard .... Mel and Tim? Did you go to Wigan Casino? Are you into northern soul? 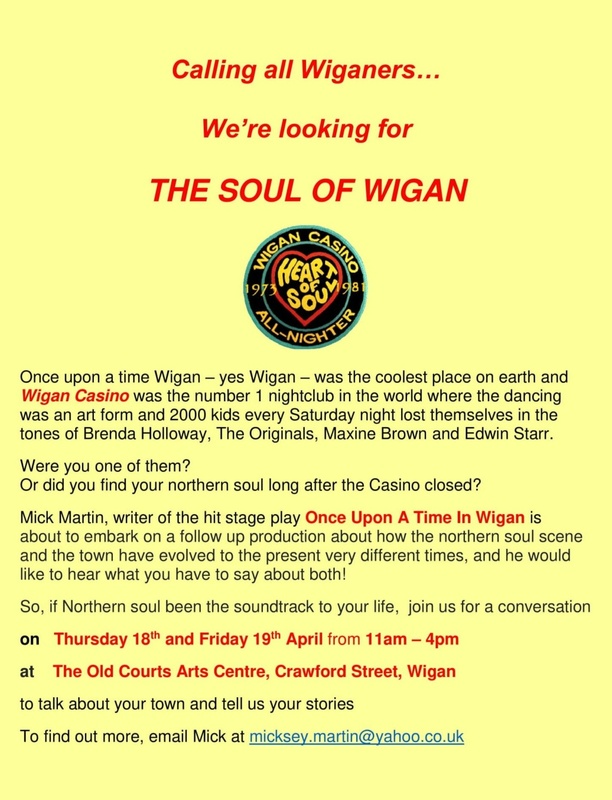 Mick Martin, writer of the hit play 'Once Upon Time in Wigan' is looking to meet you! Pop along to @theoldcourts on Thurs 18th & Fri 19th April, 11am-4pm. See flyer for details.